These days, home upgrades are increasingly focused on one key feature: connectivity. In 2019, buyers want smart homes they can easily control from anywhere. From smart HVAC and sprinkler systems to connected garage door openers, it’s all about creating convenience and comfort. Security systems are nothing new, but the technology used to arm those systems is changing rapidly. Home security companies now offer fully connected systems that allow users to protect and monitor their homes from any smart device. Whether it’s a live video feed, the ability to lock and unlock doors remotely or just checking that all sensors are working properly, integrated security systems offer peace of mind. Having the infrastructure in place can be a selling point for buyers who want to make sure their new home is as safe as possible, given they’ll only have to set up the monitoring subscription upon move-in. According to Remodeling Magazine’s 2019 Cost vs. Value survey, a garage door replacement is the number one home improvement project in terms of return on investment. But homeowners are taking it a step further and installing new technology to make the garage more user friendly. For example, the SilentMax Connect garage door opener from The Genie Company comes with Aladdin Connect technology built in to improve convenience and functionality. Not only is the opener quiet — ideal for attached garages — but the connectivity features allow you to check whether your garage door is open or closed, grant individual access with virtual keys, instantly know when someone is operating your garage door (authorized or not), and provide a log of when each opener was used — all from your phone or smart device. 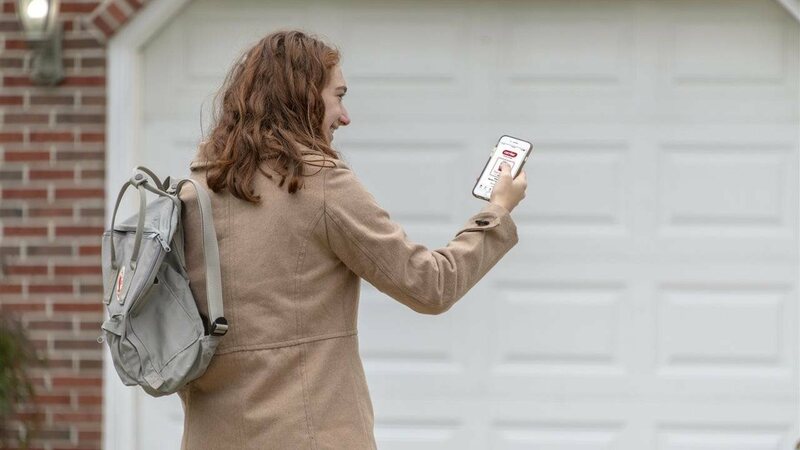 You can open the garage door remotely for delivery people, a housekeeper or for your child coming home from school. Considering your garage is one of the most accessed points in your home, this is a useful security feature and proves that garages offer more than just storage space. With the right connectivity tools and features, they can provide convenience that will be attractive to future owners. As home improvement trends go, increased connectivity is rivaled only by the desire for more energy-efficient homes. Smart thermostats accomplish both these aims and can increase the value of your home in the process. Smart thermostats let you easily control the temperature in your home from any connected device. You can set a daily schedule for your heater, adjust the temperature in individual rooms or let the system program itself based on your usage history. For energy-conscious buyers, this kind of technology provides a way of living that’s as aspirational as it is attainable. Smart lighting has turned from a novelty to a practical tool as products have gotten more advanced. Programmable lighting allows you to schedule when your lights will come on, turn lights on and off remotely, or change the lighting to improve aesthetics. With a smart lighting system, you’ll never have to get out of bed to turn the lights off downstairs, and you can always come home to a fully lit house, boosting your sense of security. With these kinds of applications, your home’s lighting can go from a ‘given’ to a must-have, attracting buyers like a moth to a flame. New, smart products are hitting the market every day. For homeowners savvy enough to incorporate this technology into their homes, they’ll not only be more connected, but they’ll likely see more offers rolling in when it comes time to sell. This spring, many people are making improvements to get their homes ready to sell. These days, home upgrades increasingly mean one thing: connectivity. Here are the best ways to improve connectivity and add value to any home. * Smart security systems — New technology means you can control your system remotely and view live video to make sure your home is always protected. * Updated garages add value — Innovations like the SilentMax Connect from The Genie Company allow you to remotely open or close your garage door, view a history of when it’s been opened and receive updates when it’s being opened or closed. * Save energy, increase comfort — Smart thermostats improve energy efficiency and comfort with custom scheduling and individualized settings. * Lighting the way — Connected lighting systems can increase security, energy efficiency and convenience by letting you remotely turn lights on or off, schedule your lights or create cool visual effects.